Mount Auburn is full of elaborate monuments, so it's hard for any individual monument to stand out. Regular old angels and marble lace won't cut it. What will draw attention? A 25-foot edifice embellished with a man-sized urn, giant mastiff, and marble relief panels depicting mail delivery. This is the grave of William F. Harnden, founder of one of America's first private express companies. In 1839, when Harnden sent his first package, the United States was expanding tremendously, both geographically and economically. Many historians have pointed toward twin revolutions in transportation and communications to explain this growth. Harnden brought both together in his express company — he shipped packages via railroad and steamship. He died in 1845 at age 31. In order to commemorate Harnden's important work, his family depicted elements of his business on his memorial. Here we have well-dressed man handing a package to a woman. He seems to have driven to her door in a wagon — the wheel is behind him and she is hatless, suggesting that she is not dressed to leave the house. I find this image a bit surprising because historians generally emphasize the role of mail and railroads in expanding political connections and business opportunities between men. With a slight clothing change, this could be an image of me accepting a UPS package containing a book from Amazon. Did Harnden envision his business as customer-oriented rather than business-oriented? And did he envision his average customer as a woman? Here we have a woman (possibly the same woman) indoors, holding a baby and caring for a toddler. Behind her, a man stares out the window. There is a stove on one side of the room and an object in the foreground that might be a little cart (?). The man is resting his hand on a stack of lumpy objects that might be packages. Is this image meant to show the interior of a house? Of a store? Is our female customer struggling to drag her offspring to the local post office to retrieve her package? Or is the man in the background her husband, waiting wistfully for someone to come and carry his packages away? Is the woman Harnden's wife, harassed by daily cares while he daydreams about deliveries? I don't know, but I'd appreciate any insight you might have. It's worth noting that the woman is still the focus of the image. In addition to these panels, the monument has several other striking features. The canopy is emblazoned with four virtues: hope, charity, faith, and justice. These are illustrated with icons — a dove, a cup, a cross, and a wide, staring eye. The eye is a bit jarring. I confess that I was expecting scales. This dog reminds me of my childhood trips to Civil War battlefields. My parents would encourage us to look for animals on the monuments to keep our interest when we were very young. 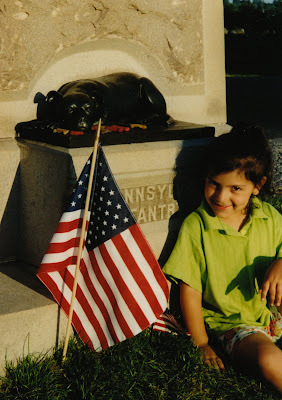 My sister had a special love for the 11th Pennsylvania's mascot, Sallie, and demanded to visit her statue on every visit.